today i'll be talking about a wonderful evening i spent at Kaya Clinic (Vasant Kunj, New Delhi) with lovely Jasinder owner of A Makeup Diary. I was invited to try their Rejuvenating Facial i.e, Kaya Youth Fill Therapy. It is no surprise that skin starts ageing as we enter our mid-twenties. The signs of ageing show differently for each one of us. While for some it is visible pores and fine lines, for others it is the age spots and loss in skin’s natural volume. Therefore, opting for a regular anti-ageing product or service without knowing what your skin needs, might turn out to be quite a nightmare. Kaya’s Age Arrest system includes a variety of services, new and revamped, that are individually designed keeping in mind the different kinds of needs of ageing skin. Youth Fill Therapy is a three step facial that starts with Microdermabrasion to deeply cleanse and exfoliate skin followed by a micro-circulatory massage with youth renewing Argan Oil. The last step is a sea-weed rehydrating mask that boosts collagen, to make skin look smoother, tightened, firmed and deeply rejuvenated with a youthful radiance. This therapy was much needed by me , as we all know our skin starts demanding extra care when we step in our mid-twenties. I have mentioned many times that i have dry skin and if not taken good care dry skin can age even faster , it could be psychological (i might have been over critical) or just the sleepless nights that my skin was not in its best condition. I was more than happy for this therapy and this being my first (professional) facial i din't really know what to expect , so i'll talk you through my experience at Kaya Clinic. Before starting to talk about the process i want to mention my therapist Deepti , she was very patient and amazing at her work. If you happen to visit the Vasant Kunj Clinic i would recommend her to you. So, once i was comfy in my reclining chair, Deepti started the procedure by cleaning my face with Kaya Face Cleanser with is great for dry and sensitive skin to clean and prepare my skin for the further procedure. After cleansing my therapist notified that she has fixed a new nozzle to the microdermabrasion tool and then with gentle and small strokes she exfoliated my face and neck. The pressure was perfect and not at all discomforting and she even kept asking about my comfort. After 15 mins she gently massaged my face with Argan oil and that was the best part of the entire session, her warm hands gently massaging my tired and puffy face, honestly i din't want those 15-20 mins to pass by. It was really very-very relaxing and comforting. She even removed some whiteheads and blackhead from around my nose , and i was ready for the final step. 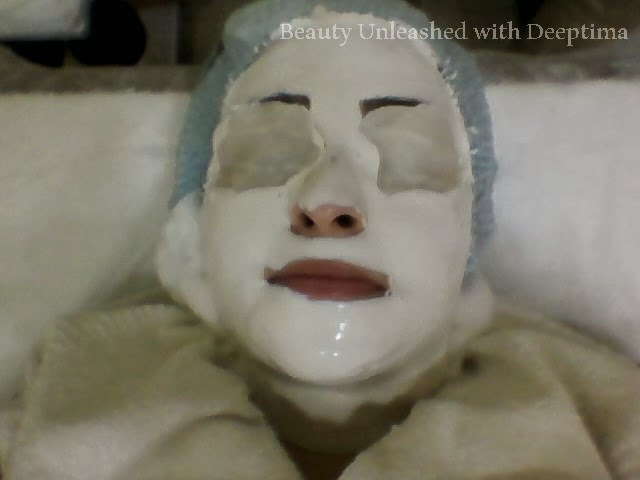 To finish the therapy, the last step was some soothing eye pads and SeeFill hydrating mask. I was asked to choose between rose water and cucumber gel for my eye pads, i opted for cucumber as i was sleep deprived and tired. The Seafill hydrating mask was a peel off mask that boosts collagen, to make skin look smoother, tightened, firmed and deeply rejuvenated with a youthful radiance. I don't have large pores or other skin problems , my main issue was dryness and lifeless skin for which the therapist suggested me to drink loads of water and asked me to use sunscreen. She also said that my skin is in a good condition and the redness and slight pigmentation is normal for light skinned people. Right after the therapy i din't see any drastic change in my skin texture and condition. It was the next day i felt the changes, my skin was much healthier looking, the dry patches i used to noticed reduced noticeably and skin stayed clean and smooth for roughly a week. If you are battling with fine lines, wrinkles, dull , dehydrated skin i would suggest you try this therapy after getting you skin tested by Kaya's dermatologist. Some products at the Clinic that caught my attention. Hope you find my review useful ! Thanks for sharing theKaya Skin Reviews, actually I am searching this type of information.